Spring 2019 SGA Elections are open! Check your RU email for a link to the voting ballot. Please vote this week! Voting ends on April 19 at (5pm -CST). My name is Leo Rojas. I am a Junior majoring in Political Science. Over the past few months, I have been involved with the Roosevelt Student Government Association as Treasurer. I would like to be President of SGA because I believe that I can help the Roosevelt student body engage with our clubs and organizations. I also believe that I have the ability to adequately communicate the needs of the student body to the Roosevelt administration. My name is Deriall Reed. 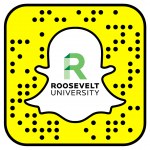 I am a Junior at Roosevelt majoring in Business Management. Programs I am apart of are GPS, SGA, and Professional Mentor Program. All of these three programs have made a major impact on my educational career here at Roosevelt. I want to be a member of the SGA Executive Council to make an impact on the board that will get more people involved with the university more than what has happened in the past. My name is Samantha Hernandez, Sam for short, and I am a Junior at Roosevelt. I am a Psychology major with a concentration in Neuroscience and a minor in Criminal Justice. My academics are of great importance to me, but I make sure to find a balance between my academics and extracurricular activities. My freshman year I applied to be an Orientation Leader which has transformed my leadership skills. This past semester I opened a chapter of Active Minds at Roosevelt, which is centered around Mental Health. Social Justice is something that is important to me and I hope to use my voice to make a difference. If granted the opportunity, I hope to use this leadership position to help create support for students in a variety of ways. I have experienced first-hand some issues students face, and I hope to work as a team to help alleviate and resolve these problems.